"My name’s become Caliban crypto hieroglyphs Written down in distorted pornographic suggestions Chiseled in the skin the words are monoliths I break apart in the annunciated contortions..." - C.Q. We live in a world in which almost all media are now dependent on some kind of electronic technology, either in terms of how it is made or/and hosted. Even traditionally printed novels today almost certainly started life as an electronic file on a word processor. In this sense, almost all creative writing is digital at some time in its life cycle (Jordan 4). This suggestion assumes that hypertext fiction or hyperfiction in essence is a purely technological construct. When we think of fiction, we think of print books. Technological advances have changed how we read fiction by way of the e-book. In literary terms, hypertext fiction is as remote from an e-book as non-digital hypertext fiction is from a standard book. Hypertext makes new forms of art possible, but hypertext is not something regarded as new in the literary sense. The use of hyperlink in fiction is a technological evolution of longstanding literary technique. In a digital age, hearing the term hypertext immediately connotes that technology is involved. Hypertext is a term coined by Theodor H. Nelson in the 1960s, defining it as “a form of electronic text, a radically new information technology, and a mode of publication” (Landow 2). Thinking of hypertext instead as a literary tool that expands the fiction experience beyond a linear storyline, opens a rich history of hypertext fiction that has evolved naturally to take advantage of expanding technology. Operating with this concept of a literary technique, the use of hypertext preceded its technological connotations as early as the 1940s with the publication of “TheGarden of Forking Paths” by Jorge Luis Borges. This particular work is an early example of maze-like narrative in which the reader experiences the story through branching paths, much like the narrator of the story itself. Borges work provides scholars with an example of Chaos Theory in which order is created out of disorder. The multi-forking paths that create the tale are the very model of hypertext – each chosen path taking the reader to something new. “The Garden of Forking Paths” has inspired many hypertext fiction authors and New Media scholars who find that Borges’ “metaphysical and scientific ideas relate to the emerging paradigms of hyperfiction” (Sasson-Henry 2006). These emerging paradigms would surface in the 1980s with the publication of Choose Your Own Adventure, a popular children’s book series published by Bantam Books. Each book in the series was written in second-personpoint-of-view and allowed the reader to become a part of the narrative by making choices to determine the plot’s overall outcome. This technique continues to evolve in works like 1991’s Griffin and Sabine: An Extraordinary Correspondence Series by Nick Bantock. In this series, the reader is taken on a surreal journey with the title’s characters, Griffin, an artist living in London, and Sabine, another artist living on a fictional island. Both engage in a correspondence though neither has ever met. Rather than offering branching alternatives to a linear story, the book is fully illustrated with postcards and actual letters that must be removed from envelopes and read in order to navigate the story. It is a visual journey as much as a literary one and as the mystery of the characters’ connection reveals itself, you find yourself just as invested as they are within the context of the narrative. In the spirit of Bantock, MarkZ. Danielewski’s Houseof Leaves, takes the reader through a twisting narrative rife with journal entries, poetry, interviews, and transcriptions of a documentary collected together to tell the intriguing and haunting story of a peculiar house and those who encounter it. It is a dizzying story, and at times disorienting, as pages are written with stair-stepping sentences, others with only images and a few words, creating a claustrophobic element that boxes you in with little where else to turn. It is an unconventional and multi-layered narrative complete with footnotes written by the character Johnny Truant who is actually reading the transcripts and documentation gathered by a blind scholar, Zampano. Danielewski goes a step further than Bantock by creating supplemental experiential hypertext for his novel. Singer/songwriter Poe, Danielewski’s sister, wrote a companion piece to the book, an album entitled “Haunted” which alludes to various elements found in the book as well as linking it with a story involving her father and a collection of audio tapes she found after his death. The tapes and messages from the novel are used throughout the music and lyrics. The music video for the first single “Hey Pretty” includes her brother reading from the book over the music. This non-digital literary tradition is continued as recently as 2013’s S. by J.J. Abrams and Doug Dorst. Here we are presented with a story within a story about two university students who are corresponding over the details of an elusive author and the mystery behind his identity. The fictional author, V.M. Straka’s novel, Ship of Theseus can be read as a standalone novel, while the story outside of the novel takes place in the book’s margins and with removable and interactive supplementary documents included with the book, such as physical postcards, letters, and newspaper clippings. The common thread through these non-digital hypertext fiction works is that the expansion beyond a linear storyline is still controlled. The reader’s experience is mediated by the supplemental hypertext information provided by the authors. This control of the experience, even in letting the reader choose his or her own experience is all the more important in the digital landscape. In digital hypertext, if the hyperlinked text is not used in a thoughtful and finite way, the reader can start drawing in other conclusions that aren’t a part of the author’s original intentions. In addition, in a digital hyperlink, the author has to be cognizant enough of the point being made in the larger story, and that the points are not being undermined by the hyperlinks. By this intentional mediation by the author, if the reader decides not to take the hyperlink journey, the author’s intentions are still within the original text. As Bolter states, “hypertext is not nonlinear, but multilinear. Each reading of a hypertext must be a linear experience, because the reader must move from episode to episode, activating links and reading the text that is presented. The problem that hypertext poses for the reader is the problem of understanding the multiple lines she must travel in traversing the web of the text” (Bolter 128). 1. Nodes: a collection of data organized around a specific topic. 2. Links: anchors to provide users with “some explicit object to activate in order to follow the link. 3. Buttons: Visual cues to alert a user that a link exists. 4. Editor: enables a user to create a node and link it into the network. While these elements are discussed as new opportunities presented by technology, in reality these concepts are easily found as early as the late 1800s into contemporary literature. While Borges’ “The Garden of Forking Paths” is regarded as one of the first incarnations of hypertext fiction, an argument can be made that these concepts were first seen in 1897’s Dracula by Bram Stoker. The novel is epistolary in format, utilizing letters, diary entries, newspaper clippings, and even ship logs to advance the story. 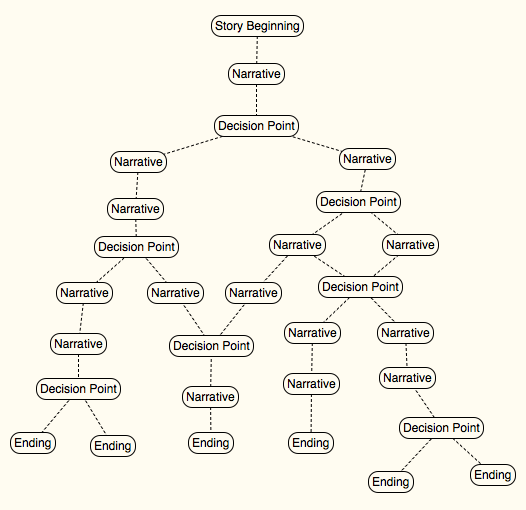 Each of these elements of the novel’s format represent nodes, a collection of data, supporting the overarching story. Links are the most easily identifiable of these elements in almost any hyperfiction story. Most obvious example of this are the choices presented to the reader in a Choose Your Own Adventure book. At the end of a plot point within the story, a reader is given several options to propel the story forward. These choices operate as links by providing options and directing the reader to specific new pages to continue the story. The element of Buttons is showcased in Griffin and Sabine by way of literal and visual cues via postcards and envelopes taking you from one correspondence to the next. These letters and postcards are not supplemental to the book, but placed at specific junctures in the text prompting the reader to open them at that point. In regards to the fourth and last element of hypertext, Editor, both S. and House of Leaves incorporate an author/editor who compiles a collection of data (nodes) and links it together within a network (the narrative) to create an internal structure for the reader. Simultaneous to the literary evolution of non-digital hypertext fiction was the technological evolution of digital hypertext and hyperlinks. Founded in 1982, Eastgate Systems became the leader in publishing hypertext fiction in a digital space. One of the most renowned hypertext stories published at this time was Michael Joyce’s “Afternoon, a story”. “’Afternoon’ combines the sophistication that we have associated with printed fiction with the immediacy of an interactive adventure game. It is a fiction and a game at the same time” (Bolter 124). Interactive Fictions, or IF, achieved commercial success during the late 70s and into the mid-80s, marketed for home computers. They were primarily text-based only and were the precursor to interactive videogames like Myst. The text-based format, much like current roleplaying games and a variety of other genre videogames, focuses on a protagonist who is assumed by the player to navigate and complete the game. Like Choose Your Own Adventure, the story is presented in a second-person writing style, addressing “you” the player as the character in the story. In this way, Bolter is right in suggesting that “hypertext makes a claim to an authenticity different from an authenticity of print: it offers the reader a new literary experience in which she can share control of the text with the author” (Bolter 122). The emergence of both technology and the opportunities that digital hypertext fiction provided also meant that a space for that fiction needed to be created. Eastgate created a website devoted to the publishing of fiction, nonfiction, and poetry presented in a hypertext landscape. The website provides various tools to creating and editing hypertext fiction with programs like StorySpace and Tinderbox. Programs such as these allow authors to construct different narrative pathways by taking advantage of hypertext. As much as digital hypertext fiction is different from an e-book, they both face the same challenge moving forward: getting readers to move from a non-digital to a digital format. “Books feel good. They operate well. It turns out that hundreds of years of publishing have field-tested for us the best ways to display text, to compose pages” (Kostick 2011). Landow argues that hypertext has “the capacity to emphasize intertextuality in a way that page-bound text in books cannot” (Landow 55), but as history of this form of literature shows, page-bound texts is able to offer as rich an intertextual experience as digital hypertext fiction. Hypertext fiction can continue as a rich part of a long literary tradition or it can take advantage of what technology offers to evolve into its own literary form and format. The non-digital hypertext literature I’ve presented represents a small, but influential portion of an interactive library that exists in the literary world. Each offers their readers a chance to view the world of a story in nonlinear and amazing ways, helping reshape how we read, and reinvigorating and sustaining our passion for the written word. New York. Routledge, 2011. Print. Christanto, Hendrick. "Elements of Hypertext." Elements of Hypertext. N.p., n.d. Web. 24 Mar. Fiction." New Writing: The International Journal For The Practice & Theory Of Creative Writing 11.3 (2014): 324-334. Literary Reference Center. Web. 23 Mar. 2015. Kostick, Anne. "Digital Reading: Are We Experienced?" Digital Book World. N.p., 13 Jan. 2011. Web. 24 Mar. 2015. <http://www.digitalbookworld.com/2011/digital-reading-are-we-experienced/>. Landow, P. George. Hypertext 3.0: Critical Theory and New Media in an Era of Globalization. Baltimore, Maryland. Johns Hopkins University Press, 2006. Print. Comparative Literature & Culture: A Wwweb Journal 8.1 (2006): 1-11. Literary Reference Center. Web. 23 Mar. 2015. Brilliant. I had never considered these works as hypertext. This definitely gives me something to think about. "Infinite Jest" by David Foster Wallace could be another example. The novel has footnotes, which are as crucial to the plot as the story itself, if not more so at times. Some of the footnotes are several pages long, which is not surprising. Some of the sentences in the book are also several pages long. But, that's a different topic. David Alan Hernandez is a native-born Texan currently working on his bachelor’s degree in creative writing/education. The author enjoys exploring the darker side of literature, continuing to hone his craft and forge his voice amongst his community of fellow writers. His work can be found published in various online horror and fantasy Ezines including, The Harrow, Sonar4, Flashes in The Dark, Microhorror and also the college literary journal, The Rio Review.